The Republican takeover of the U.S. Senate could elevate the status of Maine Sen. Susan Collins, a moderate and the senior Republican woman in the chamber. 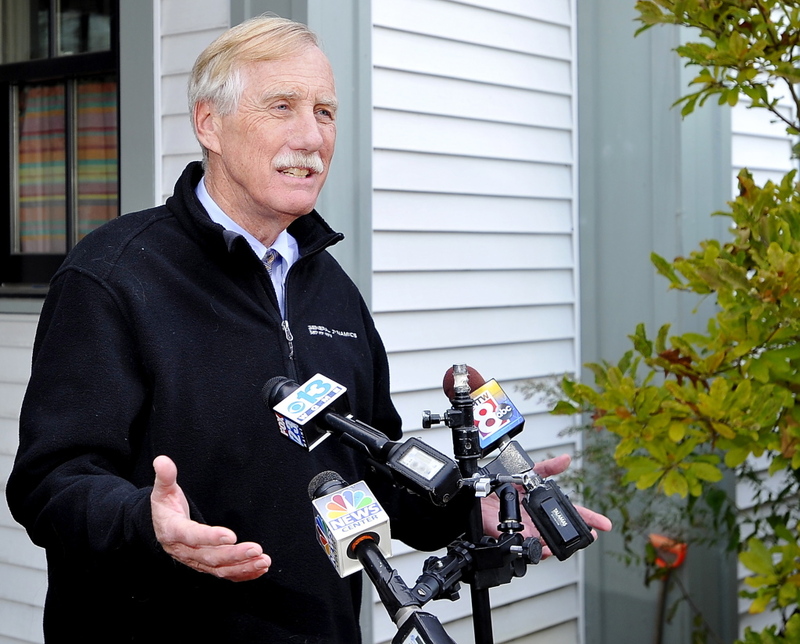 Maine Sen. Angus King announced Wednesday that he will continue to caucus with the Democrats in Washington despite Republicans’ regaining control of the U.S. Senate. King, an independent, acknowledged that caucusing with the majority party has perks. But King argued Maine is better served by him caucusing with the Democrats, especially with Maine Republican Sen. Susan Collins seated on the other side of the aisle and a Democrat in the White House. King said that he hoped that both he and Collins – two centrists in a deeply partisan Washington – could work to “pull” their colleagues toward the political center. He votes more consistently with the Democrats but has bucked the party on some issues. “I think it is in Maine’s interest to have a senator in each camp,” King said in a news conference outside his Brunswick home. “The reality of the current Senate, whether it is controlled by Democrats or Republicans, is that nothing can or will happen without bipartisan support. Republicans clearly picked up enough seats to flip the U.S. Senate. The changeover is likely to elevate Collins’ status as a moderate Republican in an increasingly conservative caucus and as the most senior Republican woman in the Senate. Collins, who defeated Democratic challenger Shenna Bellows on Tuesday to win a fourth term, will be in line to take over as chairman of the Senate Appropriations Subcommittee on Transportation, Housing and Urban Development and as chair of the Senate Special Committee on Aging. “It will allow me to hold more powerful positions in the Senate, and that’s good for the state of Maine,” Collins said. Speaking at Bath Iron Works after touring the newest “stealth” destroyer with the U.S. Navy’s top admiral, Collins also noted that she will now be in the majority party on the Senate Appropriations Defense Subcommittee that holds the purse strings on the Navy shipbuilding budget. One longtime Senate observer, Rutgers University professor Ross Baker, said that Collins could be in a position to attempt to bargain for higher-profile positions because of her seniority and the lack of women in Republican leadership. Women currently hold eight chairmanships among the 20 committees in the Democrat-controlled Senate. Only two Republican women – Collins and Sen. Lisa Murkowski of Alaska – currently serve as “ranking members” that traditionally translate into a chairmanships. But Baker, a part-time Maine resident who has worked as a senior adviser to senators from both parties, said being in the majority party can come with strings attached, especially for senators in higher-profile positions who are under more pressure to vote with the party. Collins, for her part, pledged throughout her re-election campaign to continue to work as a “bridge builder” between the two parties regardless of who controlled the chamber. King’s role in the new Senate could change as well, in part because Democrats will lose committee seats. He received “a bunch” of calls from senators in both parties after the election but declined to name names. The independent created a national buzz last spring when he suggested he might be willing to caucus with the Republicans if it served the interests of his constituents. The majority party sets the agenda, controls action on the Senate floor and holds more seats on the committees that carry out much of the policy work in Washington. Party leaders divvy up those seats, which is why independents join caucuses. King received several sought-after committee assignments after opting to join the Democratic caucus following his 2012 election, including to the Senate Armed Services Committee that oversees Navy shipbuilding, a critically important defense sector for Maine. The former two-term governor quickly gained a reputation for his willingness to work with members of both parties as he helped negotiate a bipartisan deal on student loan reform and participated in a group Collins led that attempted to end the October 2013 government shutdown. “In the end who I caucus with is much less important than who I work with,” King said.